It is important to make sure your pet is comfortable on Halloween! 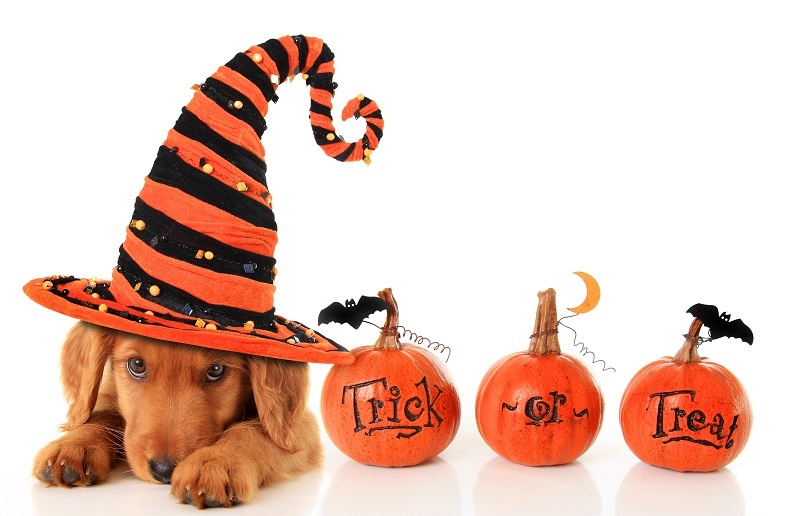 Halloween is a time of fun, fantasy, and frolics but what about for your pets? For your pets, this is a time of strangers, strange smells, and dangerous fire. But that doesn’t mean you can’t have fun with your pets this Halloween. Let’s take a look at some Halloween safety tips for pets. After a long night of tricks and treats, it is important to keep your child’s candy stash away from your pet. Kids love to hide candy in their rooms but this could mean your pet will have easy access to it. Make sure to keep candy up high and away from your pet’s mouth. If they do eat some Halloween candy, make sure to get them to a vet right away, especially if it contains chocolate or xylitol. Halloween seems to be a popular time for kids to hide their faces, but that doesn’t mean you should hide your pet’s. The combination of strangers on your doorstep and scary costumes can cause your pet to spook and bolt. Make sure your pet is wearing proper ID and a reflective collar so they are visible in the dark. While it may seem like a good idea to put a candle inside your jack-o-lantern, candles are never safe around pets. Between the visitors and the activity of the evening, open candles could be dangerous for your home and your pet. Open candles, even in a pumpkin, could cause a fire or put your pet’s fur. Instead, use a flameless candle for a safe alternative. Who doesn’t love the idea of a pet in a costume? But no matter how cute they look, some costumes could harm your pet. If you are planning a costume parade, make sure your pet’s costume fits them well and isn’t going to get tangled or cause them to slip. You should also make sure there aren’t any choking hazards on the costume like small beads or coins that they could choke on. This entry was posted on Friday, October 14th, 2016	at 2:42 pm	. Both comments and pings are currently closed.